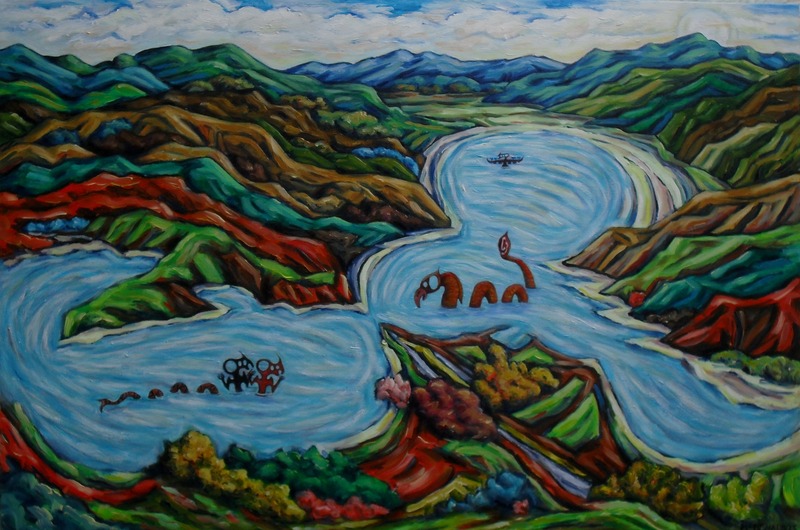 PoriPori is another taniwha with links to Porirua. He was chased out of the Wairoa River, Tauranga area by Te Pura, who took dragon form. Te Pura became tired of PoriPori killing villagers under Te Pura’s protection. The chase went north around the Coromandel, across Tamaki, and down the Taranaki coast until PoriPori spotted an opening in the coast by Mana Island. The conflict continued in Porirua harbour, with PoriPori’s tail thrashing out channels and landforms in the Pauatahanui arm. Te Pura was victorious and went back to Tauranga. PoriPori felt whakama (shame) and couldn’t follow, he remains sulking in the inlet. I’ve depicted PoriPori as having 2 heads, based on a ancient Maori etching at Opihi, a cave near Timaru and in traditional Maori colours of black and red. Te Pura is based on the Manaia taniwha. The landscape is cartoon and bold, which seemed to suit the subject. The view is from above Mana/Camborne suburb looking south to Porirua City on the right. Oils on canvas 24″x36″. Exhibited at Porirua Museum, Pataka June 2013.